Looking for a fresh exotic fruit to add to your diet and take your salad bowl to the next level? Go tropical with the versatile papaya, the tender orange fruit with a soft, buttery consistency and a sweet, almost musky taste. Inside, you’ll also find the black, round seeds. They’re edible too, although their peppery flavor is a little on the bitter side. And don’t pass over the green papaya. Popular across Southeast Asia, they are simply immature papayas that have not yet begun to ripen. When they’re green, papayas have white flesh, a neutral flavor, and crunchy carrot-like texture – a match for raw salads and coleslaws. If you’re health-conscious, too, this is the fruit for you. Papaya health benefits for skin, papaya health benefits for the liver, papaya health benefits for men – and women, but men take note! – there are plenty of papaya and papaya seeds health benefits. This superfruit is an excellent source of vitamin C, and one single medium-sized fruit provides 224 percent of your daily needs. The fruit also contains a long list of other nutrients, including papain, a powerful enzyme that aids in digestion and can also be used as a meat tenderizer. Papayas are also a good source of folate, vitamin A, magnesium, copper, pantothenic acid, and fiber. They have B vitamins, alpha- and beta-carotene, vitamin E, calcium, potassium, vitamin K, and lycopene, the potent antioxidant most commonly associated with tomatoes. Have a look at the nutrition facts chart we’ve provided. As we’ve mentioned, the fruit is rich in vitamin C, a key component in new skincare anti-aging products. But why not eat the fruit and glow from the inside out? Vitamins C and E and antioxidants like beta-carotene all help protect your skin from free radical damage. That means, keeping wrinkles and other signs of aging at bay. Papaya has natural skin health benefits to even the skin tone and improve texture, and you can easily make a homemade papaya enzyme mask or papaya mask for hyperpigmentation. More on these in a minute. Who doesn’t want healthy hair without dry ends or a flaky scalp? Papaya acts as a natural shampoo because it is rich in minerals, vitamins, and enzymes – cleansing the scalp and making your hair softer and smoother. There are great homemade shampoo recipes for fine hair and homemade shampoo recipes for dry hair. See ours below! 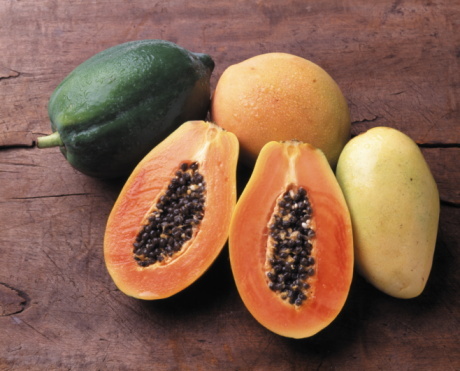 Because of their enzyme papain, papayas are excellent for digestion. With good digestion, you’ll increase your energy, improve your sleep, and stay regular. This is also where papaya health benefits give your liver a boost. Another shout-out to papaya’s vitamin C, which can keep you free from stress. A study at the University of Alabama found that 200 mg of vitamin C can help regulate the flow of stress hormones in rats. Low intakes of vitamin K have been linked to an increased risk for bone fracture. Vitamin K helps with calcium absorption and may reduce the excretion of calcium into urine. Eat more papaya. As we age, our vision can begin to decline, but nutrients in papayas have been shown to slow down this vision decline in the same fashion as carrots are hailed. Both carrots and papaya contain similar antioxidants that can work to help maintain vision. As with any fruit, papaya can aid with weight loss as it helps keep you full, it’s a healthy snack, and can work to improve overall health as well. Papaya is high in fiber, which is essential to help maintain healthy blood sugar levels. Furthermore, papaya aids in digestion, which is important to prevent diabetes. If certain enzymes are not properly digested they can lead to inflammation, which can trigger diabetes. There are many reasons why papaya can improve heart health. From its high fiber content, which aids in cholesterol, to its numerous essential antioxidants to keep the heart strong, papaya is a great fruit choice whether you’re concerned about your heart or not. One word of caution, if you are pregnant or trying to get pregnant, avoid papaya. Unripe papaya contains a latex substance that may cause contractions of the uterus. Papaya or papaya enzymes are recommended for soothing indigestion (you’ve likely heard all about morning sickness), but steer clear of papaya. Although a fully ripe papaya is not considered a problem, better to play it safe and avoid it altogether. No parabens or solvents here! Mash your ripe papaya (without seeds) and add a bit of lemon juice, sea salt, and pure aloe juice or gel. Take half a ripe papaya. Mash and mix with a few spoons of honey to make a paste. Apply on your face and neck. Leave it on for 15 to 20 minutes, and then rinse with lukewarm water. Now glow! For your skin, hair, and the rest of your body, eat papaya often. Change up your morning smoothie! Add ripe papaya to your blender with a sliced banana and some strawberries. Add ice and a little coconut water, and there you have it! Be adventurous with your diet and don’t miss out on papaya health benefits – great hair, skin, and overall health protection – all in this fantastic fruit.